Mo made Thanksgiving dinner last year. I think it was in November, although I never wrote the date down. We have a short agenda when it comes to Thanksgiving. Turkey, dressing/and or potatoes, cranberry sauce that we usually forget, corn, pie, cool whip. The idea is to not make too much, since it’s just us and our neighbor Char. Oh, and one other thing, a sweet potato. I think that’s Mo’s tradition and I adopted it. I don’t much remember sweet potatoes in our childhood Thanksgiving. There may have been some sort of canned thing that I avoided, but it was never on my grazing list. But Mo makes them from scratch, and they’re fabulous. When she brought home the sweet potato in the grocery bag last year, I pointed out that it looked sort of like a person. Little eyes, branches for arms. He was cute. We laughed and took a photo. And that was that. But when the meal came around, the sweet potato wasn’t part of it. She said she forgot, but I suspect it was just too cute to eat. The sweet potato watched contentedly from the kitchen counter as we ate too much. And now, as I sit at the computer in late February, the sweet potato is STILL watching. 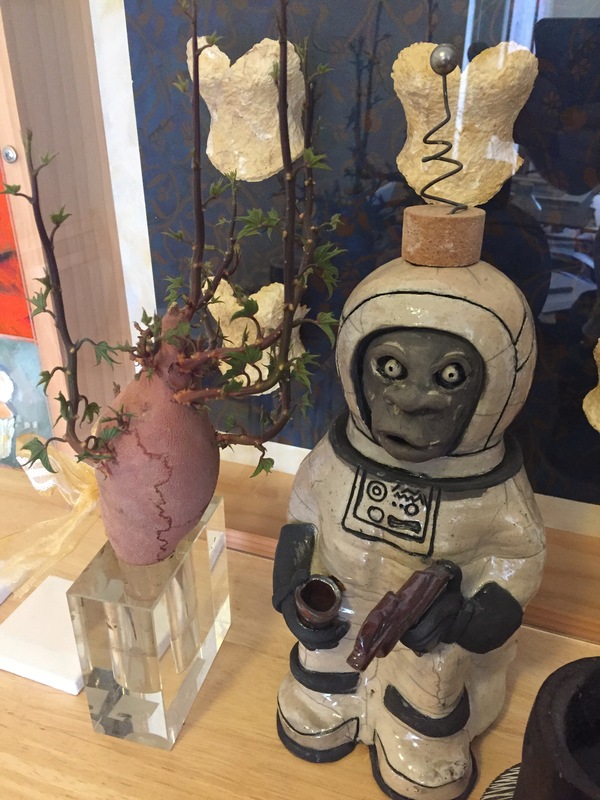 It has its own vase, a place of honor next to the Space Monkey, and a new home. Best Thanksgiving ever. This entry was posted in margarine and tagged food, life, marriage, yellow brick road. Bookmark the permalink.